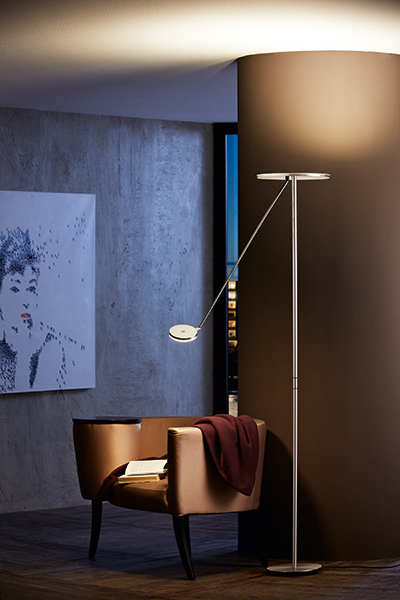 This contemporary PLANO Torchiere provides uplighting for your room with its circular top, while its extending, flexible arm illuminates your reading. Featuring five LEDs and a touch dimmer for each light source. Available locally at The Lighting Gallery by Brown's. Visit holtkoetter.com. 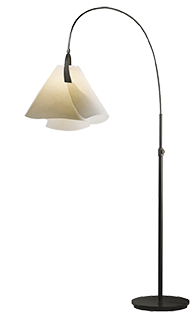 This intricately designed, versatile Moreau lamp loops towards infinity with its modern curves and clean edges. Featured in a selection of metal finishes and assorted shades. Available locally at The Lighting Gallery by Brown’s. Visit vtforge.com. A mid-century replica, the Marine Signal Tripod lamp transports your space to the “golden age” of Hollywood with its 1940s design. Created from solid teak with stainless steel, aluminum and brass accents. Visit avioninnovative.com. This whimsical, yet sophisticated Jellyfish lamp captures the spirit of its name. Hand-stitched, fossilized cocoa leaves give way to undulating wrought iron tentacles, each highlighted with a single glass bead. Visit eangee.com. Inspired by turn-of-the-century design, this classic Farmhouse pull-down lamp will adapt to your space with its simple mechanics. Shown here in antique brass. For more info, visit elklighting.com. 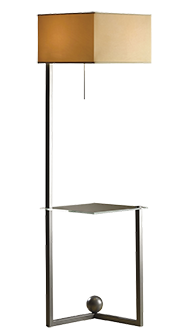 With its distinct lines and square glass platform, the modern Balance lamp combines playful geometry with unparalleled functionality. Offered in six finishes and five shade options. Available locally at Treeforms Furniture Gallery or visit vtforge.com. 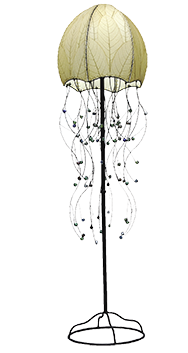 The Stargaze multi-head floor lamp casts a glow of nostalgia. Encircling the bulbs are rich black metal latticework shades. Visit quoizel.com. 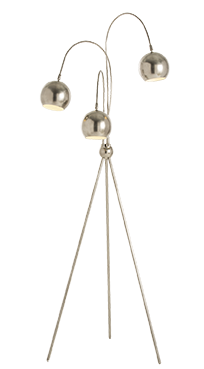 Created from industrial steel with a vintage silver finish, the Wade tripod lamp has an old-fashioned appeal. Encircling each bulb is an adjustable metal shade attached to a flexible arm, giving the lamp a dynamic functionality. Available locally at Furniture Classics. Visit arteriorshome.com. 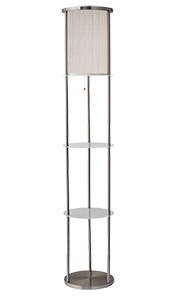 The highly textured and full-bodied Hour Glass lamp exudes a vintage feel. Its panels, showcasing layered flower patterns formed by overlapping jackfruit leaves, are beautifully framed by wrought iron edges gently curving inward for an aesthetic feminine form. Visit eangee.com. The Stefan combines vintage class and elegance with an artful geometrical play. 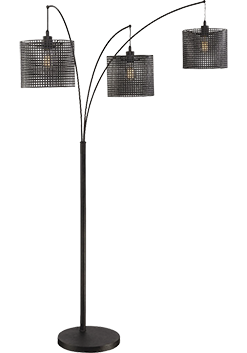 Featuring three staggered, cylindrical white glass shades supported by silver rods and a triangular black marble base. Available locally at Furniture Classics. Visit arteriorshome.com. The cylindrical Holden lamp will light the room with a soft glow while providing a little extra shelving. Available locally at Scan Home. Visit adessohome.com. With its warm glow of light, handcrafted steel collar, and thick blown-glass flask, the Erlenmeyer lamp brings a steampunk feel to any room. 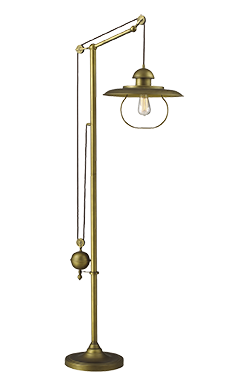 Available locally at The Lighting Gallery by Brown’s, and Ferguson Enterprises. Visit vtforge.com. The Annondale lamp combines an industrial feel with an artistic flair. The shade is encircled by a ring of delicate tan and brown Tiffany glass pieces that "float" around the tan mica drum shade. Visit elklighting.com. 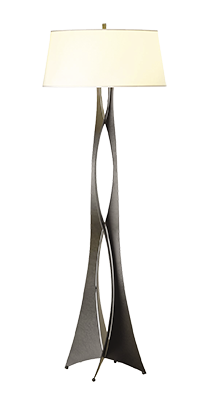 Resembling a single-stemmed flower, the Mobius has the grace of nature with the strength and permanence of its hand-forged, adjustable wrought iron base. Available through Treeforms Furniture Gallery, and The Lighting Gallery by Brown's. Visit vtforge.com.